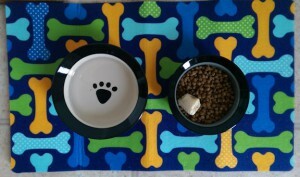 When my daughter bought her puppy, she got a plain set of metal food and water bowls in a plastic holder. That seemed just fine at the time, and we didn’t think about other possibilities until my husband mentioned that it would be good to have two sets, so that one could be put in the dishwasher while another was left out for the dog. He went to the pet store and bought a colorful placemat with two sets of sturdy ceramic bowls. The new dog accessories really brightened up the kitchen! Today’s consumer society, even with all its flaws, can be a resource for better nurturing when we buy things that make our surroundings more pleasant. Of course, we need to be careful not to let spending get out of control or let clutter pile up; but within those constraints, buying cheerful little things can go a long way toward improving one’s mood! The old set of bowls is already in the trunk of my car waiting to be taken to the thrift store. And if you are wondering—yes, that is a small piece of banana on top of the dog food. I often eat a banana in the morning, and Diva Dog decided she likes it, so I usually break off a piece for her. She is definitely a pampered puppy! Yes we need balance, but you’re right – since we must have things, we should choose beautiful things. We’re worth it!! Hi Meg, the mat is really lovely, colourful! For sure a little detail can change completely a room. First dog I heard about likes banana. Have a wonderful weekend, Happy Easter! Every detail in our environment can lend to nurturing — including nurturing our guardian companions! Thank you for sharing, and linking to Nurturing Thursday. Have a blessed Easter weekend! Many blessings to you also, Becca! It looks like the little dog brought that color into the household. Good idea for a nurtuing post. Thanks Isadora — yes, it was amazing how much happier and more colorful the room looked!